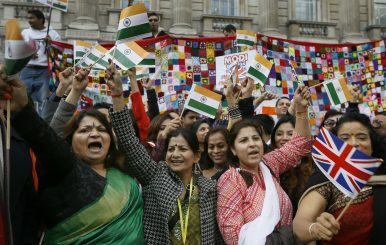 Protesters welcoming the visit of Indian Prime Minister Narendra Modi wave flags on Whitehall in London, Nov. 12, 2015. India is just beginning what will be the world’s biggest democratic exercise, with more than 900 million people eligible to cast their vote. In seven stages over 39 days (April 11 to May 19), voters will decide whether Prime Minister Narendra Modi of the Hindu nationalist Bharatiya Janata Party (BJP) should continue running the country for another five years. India has added 83 million new voters since Modi came to power in 2014, with 15 million 18- to 19-year-olds eligible to vote in this election. While the BJP has been seen as the favorite to win, its performance during the December regional elections cast doubt over whether the prime minister would be able to secure a simple majority once again. This opened up the contest and put the election campaign into full swing. And continuing a long-held tradition, the Indian diaspora have been at the forefront of the campaign. With Indians making up the largest diaspora community in the U.K., it’s no surprise that they have made their presence felt on the streets of Britain. From car and bike rallies to marathons of social media campaigning, British-Indians have been ramping up their voices to ensure their thoughts are heard. The National Indian Students and Alumni Union U.K. (NISAU) witnessed the election fever that swept over the diaspora community. As the apex body for young people of Indian origin in the U.K., they felt they had an important role to play in the run-up to the election period, particularly in regards to providing accurate information on voting rights amid a swarm of fake news and disinformation. In the week before the General Election began, NISAU released its findings on the concerns of young Indians living outside India. Key issues raised through the survey included the ability to obtain dual citizenship, hold representation in the Indian Parliament, and be given the right to vote in elections from outside India. It’s evident that the diaspora have a strong sense to remain active in Indian politics. While non-resident Indians (NRIs) — those who still hold Indian passports but live abroad — are eligible to vote in the elections, they have to be in India (and registered) to do so. E-voting or proxy voting has not yet been made available to NRIs and, thus, the members of the Indian diaspora who do vote in the elections make up a very small percentage. He noted that the Indian diaspora is engaged in four broad themes when it comes to election campaigning: raising money for political parties, providing technical services on how to run an effective campaign, volunteering for mobilization campaigns on the ground in India, and lobbying. Their expertise means that they can provide “that extra push” for election campaigns. “You just have to look at the crowds that gathered at Wembley Stadium and Madison Square Garden to realize the immense clout of influence that the diaspora can have over Indian politics,” said Dr. Ingrid Therwath, who has a Ph.D. in political science and has been studying the Indian diaspora for 20 years. In the run up to the 2019 general election, the Overseas Friends of BJP in the U.K. noted that an estimated 2,000 volunteers had registered with them to travel to India to campaign on the ground. So what makes the BJP so appealing to the Indian diaspora? Tracing history, Therwath noted during the State of Emergency in India in 1975, the Rashtriya Swayamsevak Sangh (RSS) was banned in India. They thus began to develop outside the country. By the time their political wing, the BJP, came to power in 1998, they had built strong international networks globally — particularly in the U.K. and the United States. Today, Modi has won over much of the diaspora community. From the perspective of the Indian political parties, this diaspora support is crucial. While the NRIs’ financial and technical support is important, Sharma added, “In ideological terms, the NRI community has always been a placeholder for the success of the entrepreneurial Indian who has made it. An NRI is seen by many in India as a mark of success and influence. For an influential NRI to back a political party or candidate can become a very strong endorsement. While the Hindu right has had a strong hold on the diaspora, many made their voices heard against Prime Minister Narendra Modi during his visit to London in November 2015. Photo by Priyanka Mogul. However, while the Hindu right have a clear edge over diaspora support, the anti-Modi perspective exists overseas as well. Both Sharma and Therwath were quick to point out that the Indian diaspora does not have one common voice. 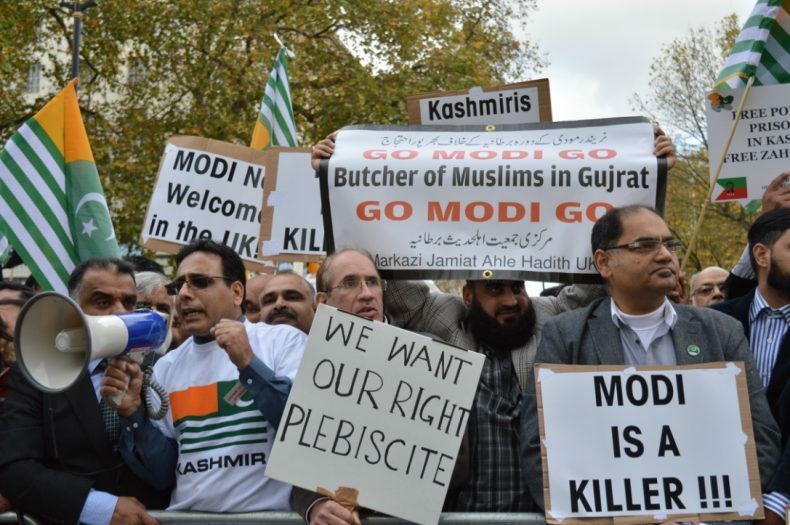 The weekend before voting began in India, protesters gathered at the Indian High Commission in London to raise their voice against the treatment of minority groups under the Modi government. Organized by the South Asia Solidarity Group, SOAS University India Society, and a number of other Dalit-rights groups, the protest is just one of many that the diaspora have convened during Modi’s time as prime minister. As millions of people head to the polls over the next few weeks, there is no doubt that the diaspora community will be watching with eager eyes — and that they will continue to play a key role as the election campaign heats up. When the results are announced on May 23, there can be no doubt that the Indian diaspora played its part.